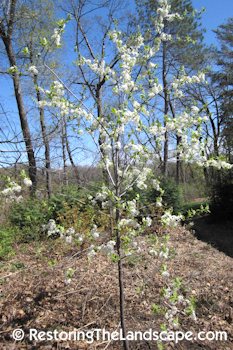 The American Plums are flowering much earlier than usual with our warm spring weather. 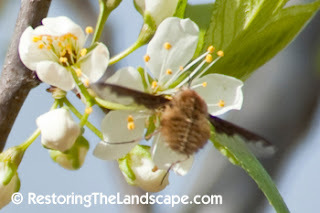 If you don't have an American Plum in your landscape then you're missing out on the extremely fragrant, showy flowers AND providing an important nectar and pollen source for early emerging bees, flies and butterflies. 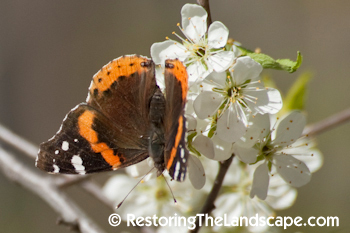 We have planted two in our landscape, this photo is of the smaller of the two. It's on the north side of the house in a sunny, dry site. American Plum is a wonderful small tree, we have overhanging wires just behind where this one is planted and at its mature height (around 15 feet) it won't impede on the wires. 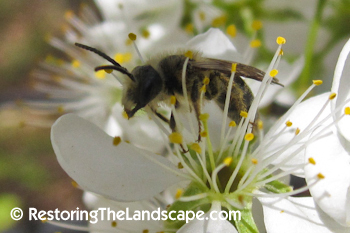 Many native bees (and honey bees) have been visiting the flowers during the warmer temps mid day. The Mining Bees (Andrena sp) are abundant although when windy have a hard time landing and perching on the flowers. 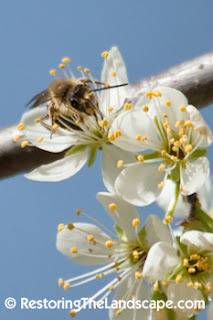 The Bumble Bees are just emerging and have also been visiting the Plum. 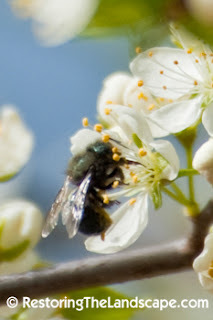 Blue Orchard Bees (Osmia lignaria) appeared late last week, their irridescent blue bodies stand out next to the Mining Bees. Orchard Bees are being managed as an alternative to honey bees for fruit crop pollination. 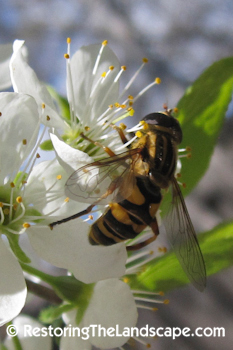 Two types of flies were visiting the Plum flowers including this large Flower or Syrphid Fly - a very convincing bee mimic. 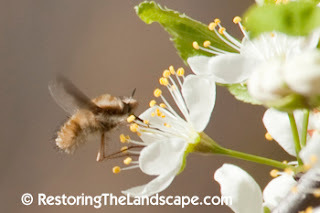 The other fly, a Greater Bee Fly (Bombylius major) also a bee mimic with its hairy body and hovering behavior. The larvae of these Bee Flies parasitize the larvae of solitary bees including the Mining Bees (Andrena sp) above. The first Red Admiral butterflies of the season were also enjoying the nectar provided by the Plum flowers. The American Plums in my yard should be flowering for another week or so and I can't wait to observe what other fauna will be attracted to the flowers.